overfishing in the past is largely responsible for the recent collapse of coastal ecosystems around North America and Australia, is the conclusion reached by a team of 18 scientists that has sifted through large volumes of geological, archaeological, historical and ecological data. Global climate change, pollution and the invasion of non-native species into new habitats have all been blamed for marine ecosystem problems in recent decades. But overfishing appears to be the biggest factor (www.news. uchicago.edu , September 3, 2001). Accoridng to Susan Kidwell, professor of geophysical sciences at the University of Chicago, usa , "The depletion or near-complete removal of top predators and of habitat-modifying organisms like oysters by human fishing is the fundamental culprit, and this has been going on for centuries in some areas. A lot of the deterioration that we see today is the final outcome of a collapse that has been occurring over much longer periods of time." The team led by Jeremy Jackson, professor at the Scripps Institution of Oceanography, usa, and other ecologists have noted that the ecosystems they have been studying in recent decades have been so significantly altered by human impact that the environments no longer could be viewed as natural. So Jackson put together a team of scientists that included geologists, paleontologists and archaeologists as well as marine ecologists in order to assess more precisely the condition of selected marine environments for thousands of years. Specifically, the team searched for key biological information on the changing population and body sizes of fish, marine mammals, seagrasses, kelp forests and reefs. The team also compiled information on other marine health indicators such as the incidence of marine diseases, invasive species, low-oxygen situations (red tides), and the relative productivities of microbes versus animals on the sea floor and in the water. The timing of changes in these conditions were then compared to the regional history of human impacts, such as fishing of fin and shellfish, sediment and nutrient run-off from land clearance and agriculture, and pollution levels from industry and other urbanisation. The data revealed a pattern of progressive 'fishing down' that began with the removal of the largest food fish, which tend to be top predators of their environments. Cod, swordfish and halibut are familiar examples. Once fisherfolk had depleted those species locally, they moved farther, but they also shifted down to the next-largest edible fish. 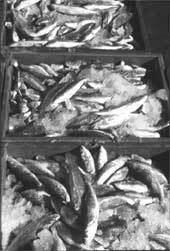 Eventually, commercial fisheries ended up depleting top predators in even the most distance parts of the globe. Researchers were able to isolate overfishing as a major problem because the timing and nature of human impact on coastal ecosystems has been highly variable on the east and west coasts of North America and in Australia. Scientists found links between increased nutrient runoffs and modern problems such as red tides, low-oxygen waters discolored by population blooms of often-deadly microorganisms.